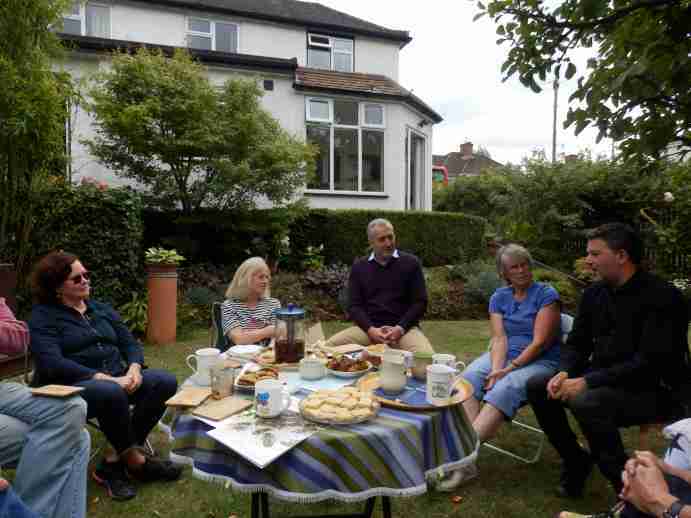 10 beeks gathered at Helen’s on a sunny Saturday afternoon for heaps of cake and biscuits (thank you Helen, Jane & Anne! ), a bit of bee nattering and a peer at Helen’s hives. The attendees were mostly TBH users, so that hive type dominated the discussions. Gino explained how he feeds bees in his TBHs using bars with holes leading to a feeder in the roof space. Then he showed how to ensure comb is built straight, along bars: the key is to only give the bees a narrow gap to build in, between barriers which are already straight, like the end wall of the hive, or by moving already-straight combs apart to create gaps. You eliminate their options to build in any other direction. Other aspects of comb management in TBHs were covered, such as moving comb for winter so all the honey is at one side of the cluster (so they don’t eat their way to one end then starve, unable to cross a cold void to reach remaining honey); and gently squishing early comb when soft to ensure the first couple of combs are built straight, along bars. These have been bothering everyone’s hives recently as their sources of sugars dried up. But as the ivy flow began, I noticed the wasp attacks suddenly stop: beehives are guarded by lots of bees at their entrances, and ivy flowers are a less hazardous food source! Gilliane had a similar experience with wasp attacks stopping abruptly, but in her case she found it was because a badger had eaten the wasp nest, wasps and all. Gino lost one small colony to wasps. Opening the hive at one point, he found bees on one side of a comb and wasps on the other! Gilliane added temporary winter insulation to her hives last year, and is sure this helped them overwinter strongly. This view is reinforced by the fact that her colonies built up rapidly and were the earliest in the area we know of to swarm. She is now looking at permanently improving her TBH roof insulation with added wool. Helen recommended old woollen jumpers, but warned they make good mouse nests! Recently a lot of people have become interested in using cork as an insulator. It’s 2-3 times better than cedar, but not as weather resistant. There are various experiments ongoing with using it on the inside of a cedar hive, and with putting it on the exterior but then wrapping some kind of weather shield round it. Related to insulation, we debated whether it is best to have an open mesh floor over winter, for ventilation; or a closed floor. In summary, opinions differ, but the bees seem to manage either way. Two of us in Oxford have been Inspected recently. The inspector, Phil, was gentle and respectful towards the bees and handled the combs expertly. No evidence of disease was found. Helen opened her hives far enough to show us what was going on, stopping when she got to the first brood combs. One hive is populated by a cast from the other, and has thrived, filling a half of the large TBH with comb in just 4 months. She gave it a comb filled with pollen that had collapsed in the other hive, and the new colony stripped the pollen out. These hives were built as a carpentry project by Helen with reclaimed wood and some other bits bought from a well known DIY chain with accumulated nectar points(!) They are a hybrid design incorporating some Warre ideas into TBHs, and were the subject of a previous post here. They work really well, the bees build straight comb in an easily inspectable hive. Many thanks to Helen for opening her house and apiary to us! 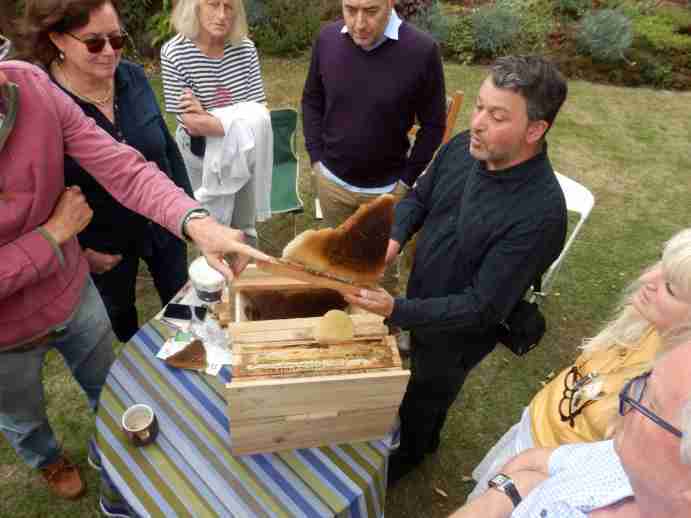 Next meeting: Saturday Sept 22nd, at Gareth’s apiary in West Oxfordshire. This entry was posted in Inspections, Meetings, ONBG, Pests, TBH and tagged Wasps. Bookmark the permalink.